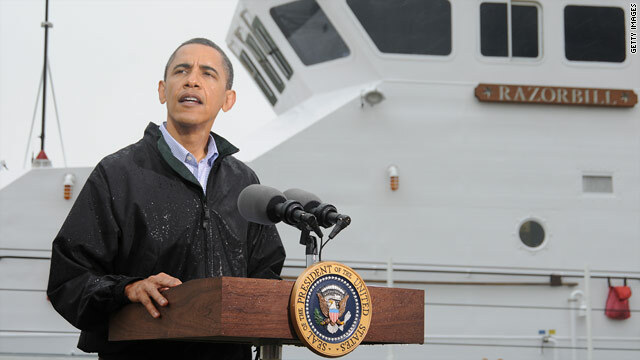 Is Gulf oil spill Obama's Katrina moment? President Obama has faced criticism over his administration's response to the Gulf oil spill. (CNN) -- There's a huge sticky mess floating towards the southern United States. It's crude oil but it's politics too. "Obviously, there's going to be a significant challenge and we are going to be working overtime," said President Barack Obama. The challenge began with an explosion aboard an oil rig last month that killed eleven workers. Oil spewing from the undersea well has formed a slow-moving slick big enough to be seen from space. The catastrophe has brought back memories of Hurricane Katrina, the last natural and political disaster to befall the region. Katrina roared ashore in 2005, flooding New Orleans and stranding thousands of its residents. The world watched on television as people pleaded for help that, in some cases, took days to come. Even then, as a little-known senator, Barack Obama criticized the Bush Administration for what he called its slow response. Many other Americans did too. Like Katrina, the spill is proving to be a much bigger problem than government officials first expected. With the leaking well more than a kilometer below sea level, they relied heavily on the oil industry for expertise and equipment. Some Republicans are raising questions that the president will find familiar. "The American people deserve to know why the administration was slow to respond," said Republican Congressman Mike Pence. From the very outset, Obama and his aides repeatedly blamed BP, which was operating the well and organizing the efforts to plug it. And the president has his defenders. "The Obama administration has done nothing wrong," said Katrina historian Douglas Brinkley. "This has been British Petroleum not having a Plan 'A' or Plan 'B' or Plan 'C' or Plan 'D." With so much of the oil still at sea there is no accurate way to calculate the eventual environmental or economic damage it will cause when it comes ashore, but the price tag is already being tallied in the billions of dollars. BP has already acknowledged that it's responsible for the leak and will offer compensation for the damage it causes. But at the White House they are also concerned about the potential cost. They don't want the president to pay it.